Featuring an automatic or manual uplift seat that allows for safer, wider seating rows when unoccupied, the 4000 Series is expertly engineered for arenas, theaters, amphitheaters, convention centers, performing arts venues, and any other facility that requires high capacity seating. The durable X-Frame design and comfortable seating options make the 4000 portable folding chairs the standard folding chair among the most sought after arenas and venues across the country. Designed for facilities that require high capacity seating, but have limited storage capacity, the model 4010 has an uplift, thinner padded seat that folds into a small envelope for storage. 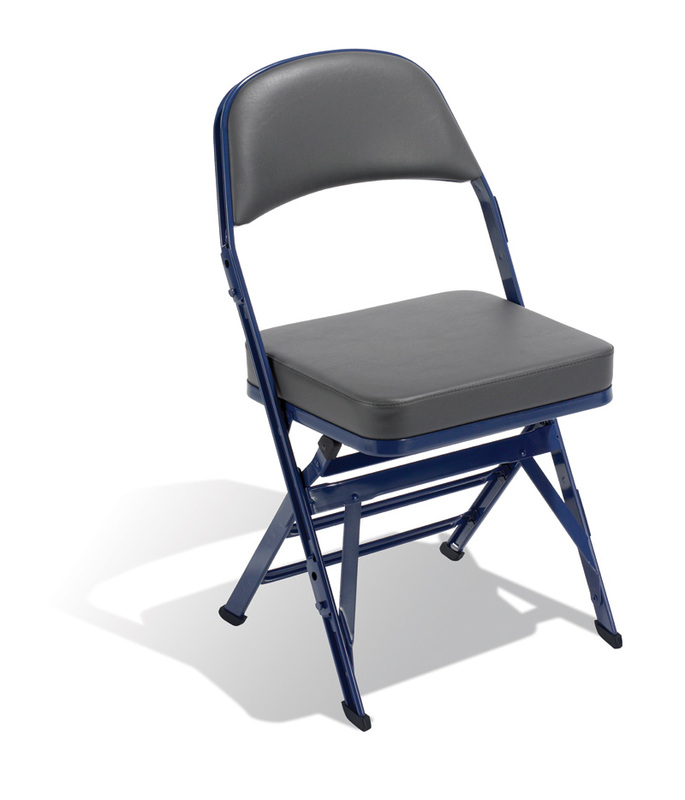 The most popular folding chair for arenas that require high capacity portable seating, the model 4400 features a thicker padded seat to keep spectators in comfort. Upgrade to our contour molded foam seat cushion for advanced spectator comfort. Also available in a 1 ½” (38 mm) wider seat to give users extra personal space. A 1 ½” (38 mm) wider seat gives spectators more personal space. 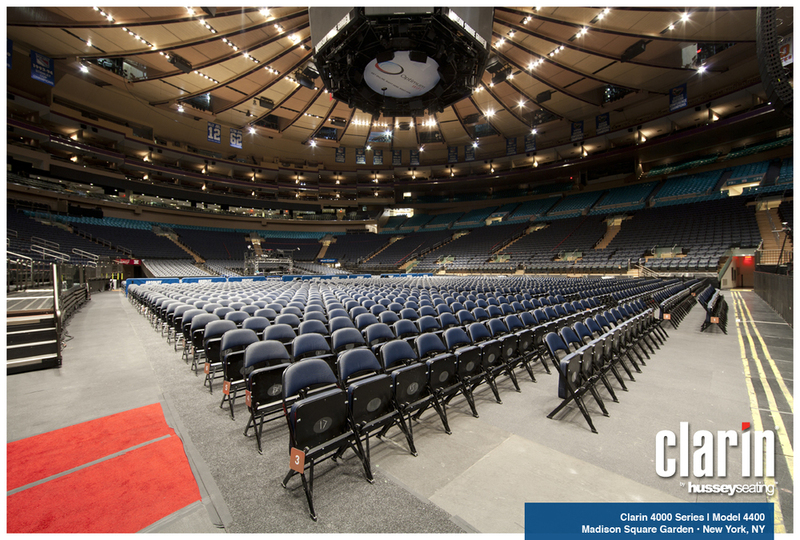 The world famous Madison Square Garden needed a world class folding chair so they looked to Clarin by Hussey Seating. They chose the 4400 with padded uplift seats that make it easy for row entry and exit. The Clarin 4000 Series Model 4400 spectator folding Chairs are tough and comfortable and can withstand the large crowds even "The Garden" can throw at them. 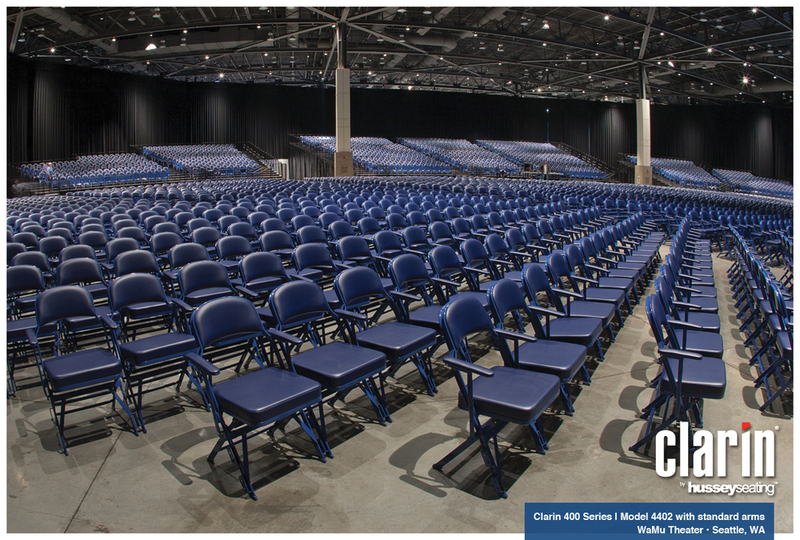 The new Cross Insurance Center in Bangor, Maine topped off their seating with Clarin 4014 uplift chairs. Great for floor seating, these chairs are stylish and exceptionally comfortable. Perfect for a graduation or gathering of any kind, they gang together to keep aisles orderly. Clarin 4000 Series Model 4010 & 4400 spectator folding chairs. Features: combination seating with upgraded 4400 chairs in the front rows for VIP seating. Radius and straight ganging options keep chairs in a uniform position. Clarin 4000 Series Model 4400 spectator folding chairs. Features: classic "A" style back design, 3" (76 mm) padded uplift seat, 1/8" (3 mm) ganging to keep chairs in a uniform position. Clarin 4000 Series Model 4400 courtside folding chairs. Features: 3" (76 mm) padded uplift seat for easy row entry and exit, under seat marking decal for seat identification, 1/8" (3 mm) ganging to keep chairs in place, printed seat and back logos. Clarin 4000 Series Model 4400 spectator folding chairs. Features: 3" (76 mm) padded uplift seat for easy row entry and exit, under seat marking decal for seat identification, 1/8" (3 mm) ganging to keep chairs in place.